Amatrol’s Portable AC Motor Drive training (990-DRV1) can be utilized for industries like packaging, textiles, paper, or many others where rapid motor acceleration or deceleration are required. This system features industry-standard components like a Rockwell PowerFlex 4 variable frequency AC drive (VFD) and a 3-phase AC motor used to teach how to operate an AC drive. This motor drives training system includes onboard analog and discrete input devices so that learners can operate the drive in many different program applications. Optional electronic fault insertion can also be added to this system to teach valuable hands-on AC motor drive troubleshooting skills. The motor drive training system is a portable solution for limited training spaces that does not sacrifice comprehensive knowledge and skill building. This portable system fits on a conference room table or shop floor desk due to its small footprint and features a durable case for safe storage when available training space must be used to teach other topics. Variable frequency AC drives control the supply of voltage and frequency to match a motor’s speed to an application, which saves energy and reduces cost. Amatrol’s hands-on motor drives training system provides the necessary skills to build AC motor drives programming and operation competencies. This system uses a Rockwell Powerflex 4 variable frequency AC drive and a 3-phase motor in addition to a digital tachometer to monitor output and a digital voltmeter to monitor analog input to the motor. The system also features a lockout/tagout system to teach vital safety skills when working with AC motors. Many training areas are not equipped with 3-phase power or do not have sufficient 3-phase outlets to set up a training class. The motor drive training system runs on single phase power to add to the convenience and range of locations where it can be used. Requiring only single phase power, this portable system can be located almost anywhere! Beginning at the foundation of AC Electronic Drives knowledge, the motor drive training course builds from the basics to advance to AC motor operation, installation, and performance analysis. As learners complete new topics, they’ll build skills like jogging control and torque control, ramping commands, DC injection braking, and acceleration methods. This motor drive training course is presented in an interactive multimedia format that features text, video, 3D animations, and interactive quizzes and reviews. Set within a durable ABS plastic case that features wheels and a handle, this system acts as a mobile training platform that delivers AC motor drive training where needed, and can be easily stored and transported. Enhance the Training by Adding Optional Electronic Fault Insertion! This system can be modified to include electronic faults by adding the Portable AC Variable Frequency Drives Troubleshooting training system (99-FTSDRV1). This modification allows users to troubleshoot over 20 faults focused on drive and motor inputs and drive relays. The 990-DRV1F (AC Motor Drive Troubleshooting Learning System) includes everything on the 990-DRV1, but also includes fault insertion capability. As the industry’s premier program utilizing electronic faults, Fault-Pro allows instructors to instantly set and tailor faults to test a learner’s weaknesses, turn them into strengths, and prepare learners to solve real-world technical problems once they’re in the field. 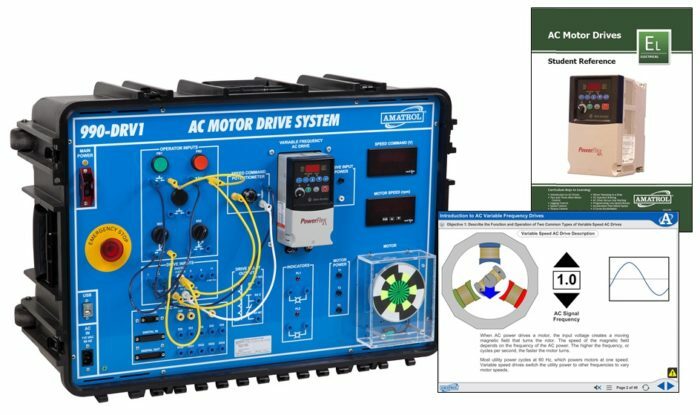 A sample copy of the Portable AC Motor Drive Training System’s Student Reference Guide is also included with the system for your evaluation. Student Reference Guides supplement this course by providing a condensed, inexpensive reference tool that learners will find invaluable once they finish their training making it the perfect course takeaway.